Get ready you F-Class shooters! We had a really good turn out with several new shooters. The weather was a little windy, but good for Nov. F-Class continues to grow. Come out and join the fun! See match results for scores. The range is closed for the exclusive use of 4H shooters every Tuesday from 16:00 to 20:00, from March 1st thru August 31st each year. IBR 2015 600 Yard Missouri State Championship. 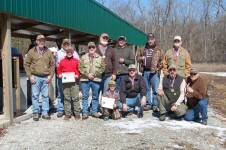 Here’s a video from our 600 yard F-class shooting match back in February. Enjoy!